The Reflex line of bushings from Abec-11 are made with high-rebound Reflex urethane formula (same formula used in their Reflex Zig Zag/BigZig wheel line) -- the Reflex Bushings come in eight durometers and three sizes. Keeping the familiar urethane color/duro code consistent with the popular wheel line (and adding a few along the way) -- the Reflex Bushings start at a soft 74a and graduate to a stiff 95a -- and come in barrel and cone shapes -- for a nice range of customizing possibilities to fit your favorite trucks. We especially like the Reflex Tall Barrels & Cones for Bennett Vector Trucks. 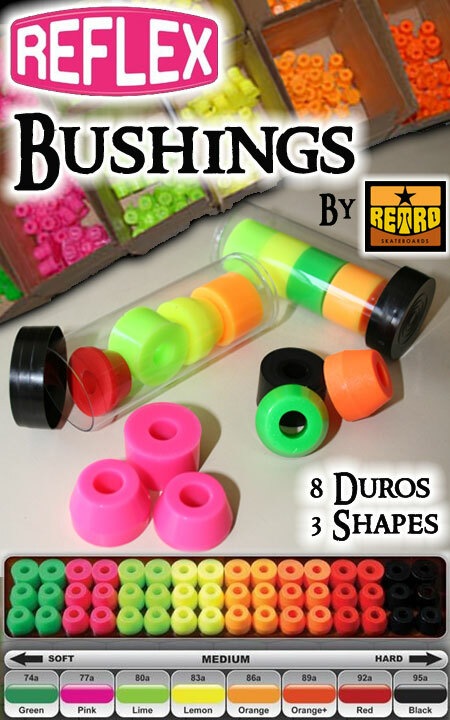 Order the duro and style for each bushing as you like. We can customize a pair to fit spherical bearing hanger type trucks (like Sk8Kings 2X, Don't Trip, Radikal, etc.) by adding a bevel on the bushing seat. Choose option when ordering. Specify truck details in notes when ordering. Choose this option to add cupped or flat washer to your bushing order.